A number of weeks ago, I wanted to answer a question related to the SAT Practice Tests – those tests the College Board made available for us to help teachers and students become familiar with the redesigned SAT. I personally wanted to check the alignment between the SAT questions on the Practice Test and the Common Core State Standards. As I worked through every single question on the tests, I discovered an interesting piece: Every single standard on the Language Progressive Skills list in the Common Core State Standards is tested. Every single one. We need to make sure everyone knows this! If you’re a curriculum type, you may want to use this information as you tweak curriculum in your district. If you’re an assessment type, maybe you’ll consider talking about this when you’re making connections between the SAT Content Dimensions and the Common Core State Standards. If you’re a principal, perhaps you’ll share this with your teachers because they are likely still learning about the redesigned SAT. If you’re an ISD/RESA person, perhaps you’ll want to include this in some of your training materials. Download the Progression of Language Skills. It’s up to teachers in multiple grade levels and content areas to help students learn important language skills, so I do hope you’ll consider sharing this with others. 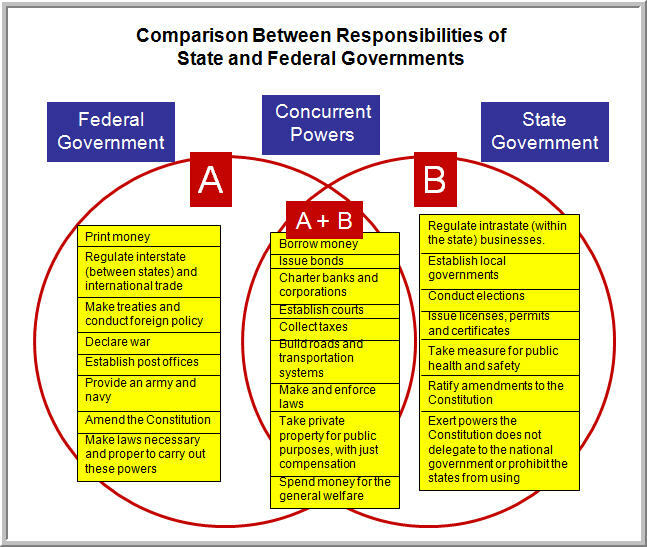 A lesson in which students use manipulatives and a Venn Diagram planner to compare and contrast the responsibilities between the roles of the federal and state governments. Additionally, a beginning list of analysis questions for the Venn diagram. For those of you who know me, you know that I always recommend making sure that students have plenty of opportunities to talk about graphic organizers after they’ve developed them.